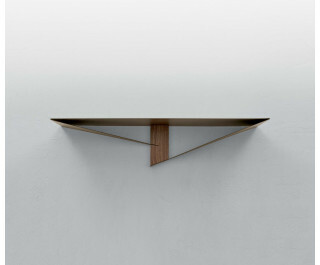 Two curved metal wings meet in a solid wood joint, creating a decoration for the wall against which they stand. Albatross console table and shelf are perfect for different interiors, thanks to the range of colors available. Stone bronze, white varnished and pink powder finishes manage to make every piece look extremely different from the other.